Toyota Motor Europe co-ordinates numerous functions for the region, from sales and marketing to the design, research and development of our future models. Toyota Motor Europe (TME) is at the heart of our European business, its prime responsibility being to manage the sales and marketing of Toyota and Lexus vehicles and parts at wholesale level. It supports the network of National Marketing and Sales Companies and distributor businesses that handle our vehicles at country level, and it provides central product planning, marketing and communications functions. They also take responsibility for business strategy, ensuring products, pricing, marketing and retailer operations are ideally suited to their local market. Its role has grown in recent years, as we have invested in expanding our European R&D and design functions, including our technical centre near Brussels and our design studio ED2. Its influence has increased, too: true to Toyota’s Global Vision, announced by our president, Akio Toyoda, it has been given special responsibility for the planning of our future small and medium-size vehicles. Although TME has its headquarters in Brussels, it is a genuinely international business – a quality reflected in the fact people of more than 60 different nationalities work there. Our training centre in Zaventem, near Brussels, is our central location for training service instructors and engineers from all our National Marketing and Sales Companies and our distributors from across Europe. Located close to our technical centre and European headquarters, it has been open since 1990, giving people the knowledge and skills so that they can in turn provide training to technicians in their own country. Toyota Motor Europe, formed in 2002, oversees the wholesale sales and marketing of Toyota and Lexus across Europe – including countries outside the European Union, such as Russia, Turkey and Kazakhstan. Our Brussels headquarters opened in 1990 and has responsibility for product planning, purchasing, quality, sales planning marketing and communications and production engineering. Recently it has also been able to lead the development of major model changes for our small and compact vehicles, such as Yaris and Auris, in areas such as research and development, design and product planning. The Toyota Technical Centre, also near Brussels, is home to our R&D, purchasing and production engineering functions. The R&D team works on the design of body, powertrain, chassis and electronics and carries out engine, component and material testing. Since 2011 the centre has been able to make use of our adjacent proving ground to test both engines and vehicles. The opportunity to lead a major update programme for our Yaris model was an important milestone in the history of our European operations. Although we had been building the Yaris in France for some years, this new project saw our European R&D, product planning and design teams taking the lead for the first time on a global vehicle, which was successfully brought to the market in 2014. Toyota has handed much of the responsibility for shaping the new Yaris to its European operations, reflecting the strength and quality of the B-segment market in the region. Notably, for the first time that changes developed for the Yaris in Europe will be adopted directly for its sister Vitz model, manufactured in Japan. Going much deeper than a simple mid-life “facelift,” the €90 million programme saw the introduction of more than 900 new parts to improve the car’s design, dynamic performance and safety. The car’s new look, with significant changes to the front and rear styling, has been created at Toyota’s ED2 design studio in the South of France. 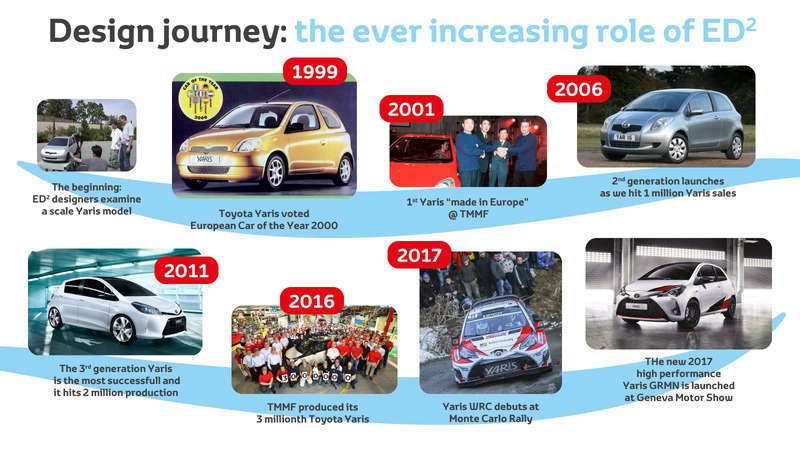 Serkan Karaman was the senior project manager in charge of the development programme for the Yaris at our R&D centre near Brussels and he explains the changes that this model brought about in Toyota Europe’s way of working. “In the past, project management for a big change of this type was always done in Japan. Of course, we gave input from Europe and were given specific tasks to be carried out here, but the schedule was set by Toyota in Japan. Vehicle Development Project Management / European Projects/R&D. Karaman’s team produced a blueprint for how the new car could be as competitive as possible, based on customer feedback and benchmarking it against its strongest rival models in Europe. Details were then adapted to suit other markets where it would be sold, such as the USA and Japan. Our European planning, design and engineering groups worked in close collaboration, helped by the fact they are all located near to each other in Belgium and France and could make quick decisions. Importantly, this also made it easier to keep much of the original body designs in the finished production car.